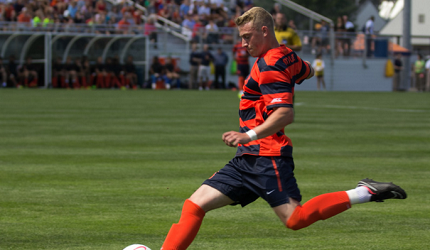 Liam Callahan is an Empire United Development Academy graduate and is a redshirt Junior at Syracuse University. Callahan, a captain for the Orange, has started in all 23 of his matches played this season and has accumulated 1 goal and 9 assists on the season. Syracuse takes on ACC rival Clemson University in the College Cup in Kansas City this Friday, December 11th, for a spot in Sunday's National Champsionship game. Orange is College Cup Bound! Syracuse defeats Boston College to advance to the national semifinals. SYRACUSE, N.Y. – Kansas City here we come! No. 6 Syracuse's magical season continues next weekend at the College Cup after defeating Boston College, 1-0, on Saturday, Dec. 5 at the SU Soccer Stadium in the quarterfinals of the NCAA Men's Soccer Tournament. Junior Ben Polk scored on a header off a corner kick in the 79th minute as the Orange advances to the national semifinals for the first time in program history. "We're delighted to be able to play a little bit more soccer," said Syracuse head coach Ian McIntyre. "There's only one more week left in the season and to still be playing is something special." Syracuse (16-5-3) dominated possession and was the more dangerous team throughout the match. The Orange earned five corner kicks in a span of 90 seconds in the second half, but couldn't convert. Finally, on its 14th corner kick of the match, Syracuse broke through. Redshirt junior Liam Callahanserved the ball into the box where he found Polk on the back post. Polk headed the ball into the left corner of the net for the only goal of the match. "We work on set pieces all of the time," Polk said. "We know our roles. Credit to Liam. It was great service into the box." "We had I don't know how many corners in the first and second half so it was only a matter of time before we scored on one," Callahan said. "I didn't expect anyone to get to that ball on the back post, but credit to Ben for scoring on it because that box was pretty hectic." Following the goal, Boston College (11-8-2) sent numbers forward and had a couple of scoring opportunities. Mohammed Moro's shot in the 87th minute went wide and goalkeeper Hendrik Hilpertmade a save in the 88th minute on the Eagles' final scoring chance to send the Orange to the College Cup, soccer's version of the Final Four. Syracuse did not allow a shot in the first half as it held a 7-0 advantage in that category at halftime. The Orange came out strong in the second half and never let up the pressure on the Eagles. Syracuse finished with a 16-6 advantage in shots and had 14 corner kicks to six for Boston College. "We didn't get an early goal in the second half but you could the momentum. If you can keep clean sheets like we did today, there are goals in this team. Thankfully today we had one more than they did." The Syracuse defense shined once again for the Orange. Syracuse's back line of junior Louis Crossand freshmen Kamal Miller and Miles Robinson along with Hilpert posted the Orange's fourth shutout in the last seven matches, which includes the ACC and NCAA Tournaments. "Down the stretch, if you can keep clean sheets, you can win matches. And if you're winning matches this time of year, special things happen. The defense has been battle-tested this year to play against the quality and caliber of teams (that we've played). I thought today, to limit their opportunities, our defense was magnificent. It starts with Ben and Noah Rhynhart up front. They work so hard. For our midfield three, the wingbacks, across the whole field – when we're at our best, we're a tough team to play against. I'm delighted that we can still play another game next week." The Orange will now face ACC foe Clemson for the third time this season next Friday, Dec. 11 at Sporting Park in Kansas City, Kansas. The teams split the previous two meetings, with each team winning on the other's home field. Match time will be announced early next week.